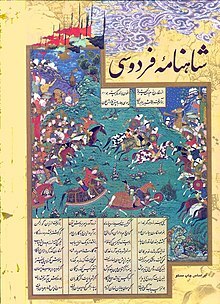 The Shahnameh (Book of Kings, Persian: شاهنامه‎) is a large poetic opus by the Persian poet Ferdowsi. The book was written around 1000 AD. The Shahnameh is about the mythical and historical past of Iran. It is the national epic of Persia/Iran and one of the greatest literary works of the Persian language. This page was last changed on 28 November 2018, at 05:35.